The thing about insecurities is that we often forget that other people have them too. I certainly do. And the brilliant and underrated MTV docudrama Catfish: The TV Show, is one of the best showcases for the ways in which people try to mask their insecurities when given the opportunity. Two people who were in contact but previously had not met are introduced on the show. 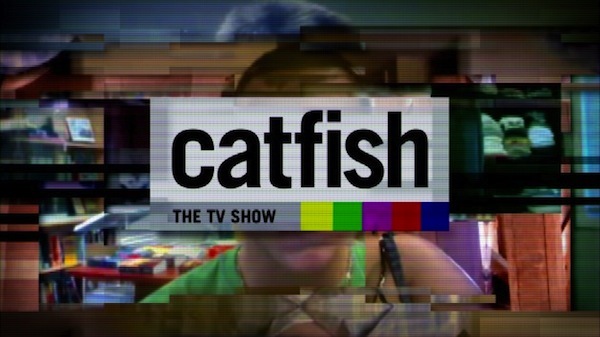 Hosts Nev Schulman and Max Joseph "investigate" the lives of the "catfisher," the person who, more often than not, has created a complicated series of lies to deceive the "catfishee" into liking him or her. Based on the 2010 documentary Catfish, the TV version seeks to reveal the potential insidiousness of online dating. More than dating though, the show reveals the power of identity creation in the Internet age. The greatest gift the Internet has provided us is not just an endless amount of information. No, the Internet has served as a means for the individual to find, create, and build a “better” or “newer” version of him or herself. The Internet has said, “This thing you’ve always wanted to know, you CAN know. This person you’ve always wanted to be, you CAN be.” To many, that possibility is heady. It certainly was for me. I always used the Internet as an outlet for my curiosities as a young girl, ranging from fan fiction to learning how to code. But it was during my senior year of college that I actually created a new idea of myself through the things and people I saw online. I never truly lied about my existence, but I was able to play up the best parts and filter the worst. And in establishing relationships with strangers online, I had to wrestle with the person they thought I truly was (overly confident, exceedingly fashionable, witty) and the person I actually am (deeply insecure, usually quiet). However, the power to see this version of ourselves is important and underlines Catfish’s appeal. What Catfish shows us is that people who seemingly have it together can harbor identities to mask the parts of themselves they find unfavorable. Its appeal then lies in its place in reality. The desire to mask and recreate is not unusual. Most of us do it to some extent. But rarely do we think the consequences of our actions would spiral as deeply out of control as the ones we see on screen. Rarely do we fall in love while trying to create and promote these better versions of ourselves. But inherent in the similarities between the people on screen and the audience watching is the desire to present a self that is “better” (financially or physically or perhaps even emotionally). Catfish both fails and succeeds in examining the root cause of the catfishing. There are a handful of episodes that are outliers. The catfisher in those instances is usually an undiagnosed sociopath at most, a pathetically-bored “tester” of human emotions at best. But for the most part, we learn that the catfisher is not as malicious as their deception claims. Rather, the catfisher is weak, insecure, and ultimately unhappy with him or herself. A longer show would possibly give us more insight into the catfisher&apos;s motivations. Have they ever received therapy? Are they depressed? How long has this insecurity (about their career, about their weight) crippled their in real life interactions? For now, we are given glimpses and left to our own interpretations. On Catfish, the majority of the episodes are founded on the catfisher contacting the show rather than the catfishee. In the scope of the television show, this is critical to understanding the importance placed on identity creation. Although the catfishers might appear to be hesitant to meet the person they were speaking to online, they ultimately find a sense of relief in no longer seeing their actions fueled by a version of themselves that does not exist. The purpose of the show is not to act as a therapeutic endeavor. Although Max and Nev provide comfort and defend the catfishee, they fail to truly dive into the reasoning of the catfishee’s devotion and the catfisher’s manipulation, deception, and exploitation. And as an audience, we don’t expect them to. It is apparent in each episode that the issues of the “stars” of the week are more complex and multi layered than could ever be explored in a mere one-hour show. These are the sort of insecurities that we can understand and recognize. Body image is a big component to the character’s interactions. Rarely will the catfisher look like the photos they have sent their victim. More than just an act of deception, their desire to choose new photos and find them easily reveals an immediate distance from the catfisher’s actual identity. They “know” that their physical appearance will deter their online pursuits and have an alternative “face” and body to call their own. Catfish takes pains to not avoid their subjects as much as they could. They show little bits and pieces of the online relationship. But rather than detailing the intimate moments between the two subjects, they instead focus on the clearly outrageous and lovesick actions that would make any sort of deception seem especially cruel. What happened between the catfisher and the catfishee usually remains more implied than broken down. If we were given a more in-depth analysis into their relationship, the deception would be more than just wrong. It would seem cruel, devious, maybe even evil. Catfish displays the ways in which we seek to better our “real lives” by creating and fueling our online lives. And it also in turn shows how deeply insecure we all are, how we allow smaller negative things about ourselves to overtake our lives, growing into something bigger than it ever was or should be. I can&apos;t turn away from each episode and I often find the most devastating episodes to be the most compelling. Evident in each hour is a reality I am all too familiar with, a reality that as I&apos;ve grown older, I&apos;ve managed to break apart slowly but surely. Catfish: The TV Show airs Tuesdays at 9 p.m. on MTV. New episodes of Catfish: The TV Show are available online. Season 2 ends Oct. 5. Britt Julious is the co-host of WBEZ&apos;s Changing Channels, a podcast about the future of television. She also writes about race and culture in and outside of Chicago. Follow Britt&apos;s essays for WBEZ&apos;s Tumblr or on Twitter @britticisms.